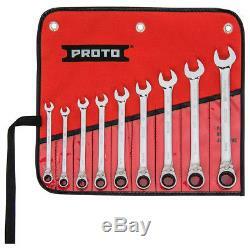 Proto JSCVT-9S 12-Point Combination Reversible Ratcheting Wrench Set - 9pc. 12 point box end allows for fine indexing, helping to improve speed and access. Fits 4, 6 and 12 point fasteners. Box end is countersunk for easy application to the fastener. Box ends incorporate the TorquePlus system. Sizes 9/32, 5/16, 3/8, 7/16, 1/2, 9/16, 5/8, 11/16 and 3/4 inches. What's in The Box. 9-Piece 12-Point Full Polish Combination Reversible Ratcheting Wrench Set - JSCVT-9S. 9/32, 5/16, 3/8, 7/16, 1/2, 9/16, 5/8, 11/16 and 3/4. SECURE & HASSLE FREE SHOPPING. All our sales are backed by a 30-Day Satisfaction Guarantee. Products shown as available are normally stocked but inventory levels cannot be guaranteed. The item "Proto JSCVT-9S 12-Point Combination Reversible Ratcheting Wrench Set 9pc" is in sale since Tuesday, March 28, 2017. 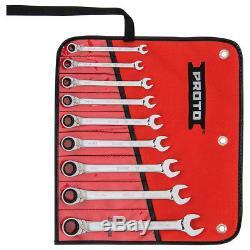 This item is in the category "Business & Industrial\Light Equipment & Tools\Hand Tools\Wrenches". The seller is "factory_authorized_outlet" and is located in Ontario, California. This item can be shipped to United States, Canada, United Kingdom, Denmark, Romania, Slovakia, Bulgaria, Czech republic, Finland, Hungary, Latvia, Lithuania, Malta, Estonia, Australia, Greece, Portugal, Cyprus, Slovenia, Japan, China, Sweden, South Korea, Indonesia, Taiwan, South africa, Thailand, Belgium, France, Hong Kong, Ireland, Netherlands, Poland, Spain, Italy, Germany, Austria, Bahamas, Israel, Mexico, New Zealand, Philippines, Singapore, Switzerland, Norway, Saudi arabia, Ukraine, United arab emirates, Qatar, Kuwait, Bahrain, Croatia, Malaysia, Chile, Colombia, Costa rica, Dominican republic, Panama, Trinidad and tobago, Guatemala, El salvador, Honduras, Jamaica, Antigua and barbuda, Aruba, Belize, Dominica, Grenada, Saint kitts and nevis, Saint lucia, Montserrat, Turks and caicos islands, Barbados, Bangladesh, Bermuda, Brunei darussalam, Bolivia, Ecuador, Egypt, French guiana, Guernsey, Gibraltar, Guadeloupe, Iceland, Jersey, Jordan, Cambodia, Cayman islands, Liechtenstein, Sri lanka, Luxembourg, Monaco, Macao, Martinique, Maldives, Nicaragua, Oman, Peru, Pakistan, Paraguay, Reunion, Viet nam.